Make your own cards! 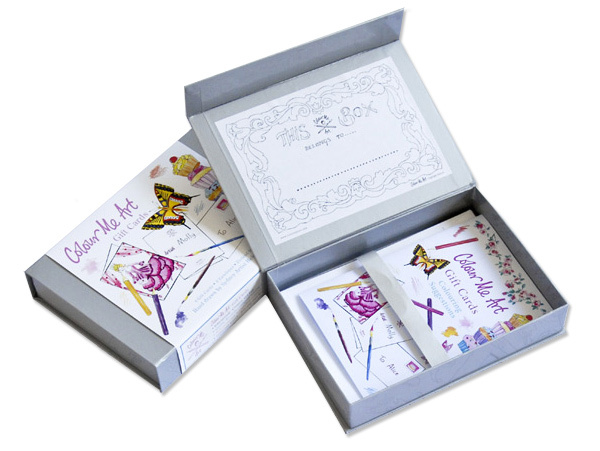 Each box contains 8 cards, 8 envelopes, a sheet of pretend stamps, a colouring suggestion booklet and a name plate so you can customise your silver box after. All 8 different designs are hand drawn by Australian artist Helen Ashley. Classic themes of fairies, princesses,mermaids, butterflies and cupcakes. Also available from upmarket independent toy and gift shops. Perfect for the party going little girl that is aged between 4 and 9 years. Creative portable craft activity that encourages an early love of writing and fine motor skills. 100% Australian made. Even the box which has a magnetic catch and perfect to reuse to store treasure or art materials. Postable present. Portable craft activity. Carefully packaged so all elements are reusable or recyclable.